ISU TSA Traffic Bowl Team with its trophy. Photo courtesy Hitesh Chawla. Members of Iowa State University’s Transportation Student Association (ISU TSA) won the 2018 Institute of Transportation Engineers (ITE) Midwestern District Traffic Bowl on Friday, August 17. 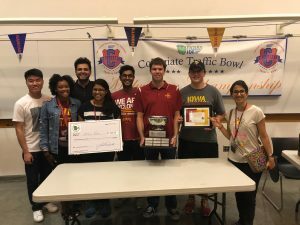 The team advanced to the 2018 ITE Collegiate Traffic Bowl Grand Championship, held on Tuesday, August 21. Competition events took place at the Joint ITE International and Midwestern/Great Lakes Districts Annual Meeting and Exhibit in Minneapolis, Minnesota. ISU TSA was one of 10 teams from across the US and Canada that competed in the championship. First place went to the University of South Florida. Congratulations to team members Ashirwad Barnwal, Justin Cyr, Archana Venkatachalapathy and Jacob Warner as well as ISU TSA for its hard work. The team also earned recognition as best student chapter of the Midwestern District ITE. Georges Bou-Saab, a graduate student member of ISU TSA, won top honors in the student poster competition of the Midwestern District ITE.